Welcome to Piazza Navona, where your curious travel mind and heart will be amazed with the life and laughter bursting out of the bars and restaurants that surrounded it, the Bernini fountain and the people. When the movie La Grande Bellezza (The Great Beauty) came out in 2014 I personally rushed to see it. The Oscar winning film polarized Italians and Romans in particular, with many criticising it for an inaccurate portrayal of life in Rome to the world but the massage was loud and clear; the great beauty of life surrounds us daily, you just need to look at things with a different set of eyes. One of the famous scenes from the film was filmed in Piazza Navona and the main character is shown visiting a house with a balcony that looks right out on to the square. A scene that yes, is not real life for the majority of Romans, but aspirational nonetheless. You can easily walked by foot to explore the streets around the districts Ponte and Parione. 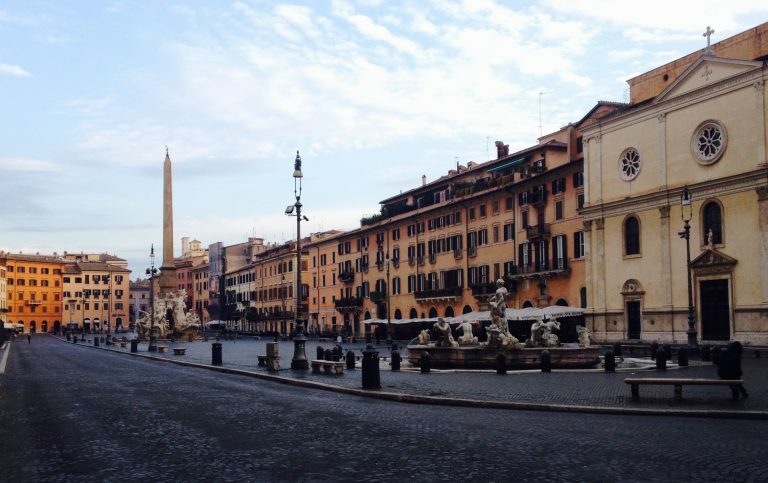 Basically the ones that lead from Castel Sant’Angelo to Piazza Navona – some of the prettiest around Rome. Our guide navigated us through a route of hidden monuments, frescoes, unexpected views of Renaissance and Baroque Rome. On Via dell’Anima just, just off the square, enter Palazzo Pamphili, a former apartment of Pope Innocent X. Now a private residential building, it features an incredible ramp built by Borromini.The palazzo is a gorgeous example of Baroque Rome and is adorned with frescoes and other ornate art features.